Super high in vitamin A and various antioxidants, carrots are a great vegetable to have in abundance in your garden and fridge. Like other root vegetables or rhizomes, carrots utilize the underground space, giving your permaculture garden a 3 dimensional pattern that takes advantage of all the room available. But like any crop, carrots like to grow with some plants and not others. Known as companion planting, permaculture gardeners practice the art of purposefully planting one crop next to another to enhance, support and/or protect each other. With carrots, there are particular species that work to improve a carrot’s growing conditions, whereas some crops can be somewhat limiting. Knowing which is which can help you to prevent common carrot diseases, while boosting yield, flavor, and productivity. How is Companion Planting Beneficial? When we are companion planting in our permaculture gardens, we are looking to improve conditions that favor our plants and discourage conditions that don’t. When companion planting, we’re actively and purposefully choosing plants that benefit their neighbors in some way or another. These benefits can come in various forms. In general, we’re looking to improve the soil conditions for our plants to increase productivity, yield, and flavor; while also reducing harmful bugs, attracting helpful insects, and providing the physical conditions that help support a plant (trellising for creepers, shade for shade-lovers etc). In doing this, we not only find ourselves with stronger crops with more nuanced flavorings, we also increase diversity through intercropping, which reduces the chance that our whole crop will be wiped out by a pest. This is because disease and pests tend to favor certain plants over others. By intercropping with companion plants, if a ravenous pest were to eat all the carrots from the ground up, you would still have a myriad of other foods to eat. Equally, intercropping and companion planting stops pests from munching their way through everything. if you were to monocrop all carrots, you’re laying a buffet out for hungry carrot flies, who come and dine to their hearts’ content – reproducing like crazy due to the abundance of resources and tearing down the whole field. By mixing it up a little, you can confuse the carrot flies into thinking you only have one or two plants, so they won’t reproduce at such a prolific rate, making them easier to control. Equally, in the true spirit of permaculture intensive gardening, by planting companions, we can make better use of our space in a 3 dimensional way, using the forest gardening patterns. This allows us to grow many more crops in the same space. You will also find that with more plants in the ground, the soil retains water better and doesn’t tend to erode so easily – instead building complex ecosystems below the surface over time. This helps to create more resilience and strength into the future. Furthermore, the more plants covering the soil, there is less chance of weeds creeping their way in, as you form physical plant barriers that stop the weeds from getting a strong root in your soil. 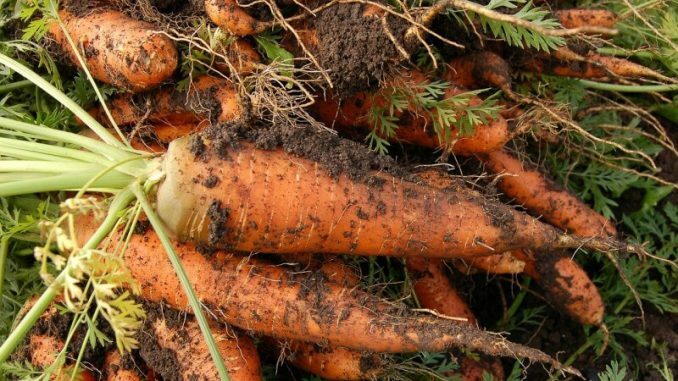 Before companion planting carrots, it’s vital to consider the conditions in which carrots thrive. A rhizomatous crop, carrots develop underground with their green shoots poking out the top. Like most unground roots and tubers, carrots like loamy soil as this is easier for them to penetrate. Hard, clay soils tend to block carrots from growing too large as they can’t push through. In this sense, finding crops that can open the soil up for carrots first will work as great companions to plant before your carrot seeds go into the ground – kind of like preparation work. In terms of sunshine, carrots can grow in partial shade. While it is possible, it isn’t ideal. They like to have at least 4-6 hours of full sunshine at the very minimum. In this With this in mind, planting taller crops in front of your carrot’s sun path will limit their full capacity to grow. Try to grow taller crops to the north of carrots – to the south will block the sun completely, the east blocks morning sun, and the west blocks afternoon sun. Lastly, as carrots come to their harvest, they pop their little orange tops out the soil. This lets you know they are ready to pick. However, if you are located in a particularly windy area, large gusts and gales can blow drier topsoil off the head of your carrots. If this happens, the exposed tops will turn green and bitter from the excessive sunlight. While the rest of the carrot is still edible, you won’t want to eat the green. To avoid this, monitor the wind paths of your permaculture garden and place taller, wind-sheltering plants in places to block out the breeze. Bear in mind the sun’s direction – you may need to plant these wind-breaks a little further away to ensure they don’t obstruct the sunlight. 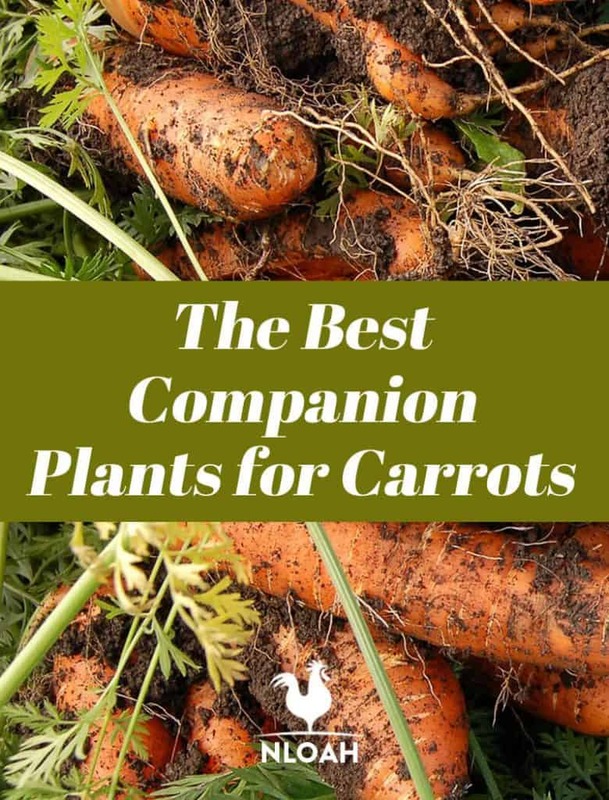 Below you will find a list of companion plants for carrots that help to benefit them in different ways. While coms companions improve the productivity and flavor, others work as integrated pest management systems, and others as environment boosters. Bush and pole beans – As legumes, bush and pole beans sequester nitrogen from the air and put it into the soil. Nitrogen helps plants grow more quickly and stronger. This is because nitrogen is an important component of chlorophyll, which is involved in the plant’s food-making process, as well as helping to form necessary proteins for the plant’s structure. By planting legumes, the nitrogen helps carrots grow. This is especially important in areas where you see green leaves yellowing as this indicates a nitrogen deficiency. However, carrots do not need lots of nitrogen, and if they receive too much, will start to fork and grow hairy. Go ahead – plant a few beans (and legumes), but don’t go nuts. Peas – Peas are also legumes so they same rules apply as above. It’s also important that you trellis creeping legumes like peas and beans to the north of carrots as not to block the carrots’ sunlight. Tomatoes – Tomatoes and carrots are good friends, but there are sacrifices. Growing tomatoes next to carrots enhances the flavor of the carrots quite dramatically, however, the tomatoes tend to stunt the growth of the carrots. Chives – Chives improve both the flavor of carrots and the productivity. Carrots not only taste sweeter, but grow faster. Importantly though, chives and beans don’t mix so keep them away from each other in your plot. Tomatoes – Tomatoes secrete solanine from their roots, which is a natural defence mechanism against certain insect herbivores, such as beetles. By planting tomatoes next to carrots, carrots can benefit from this. Alliums – Alliums include crops like garlic, chives, onion, shallots, scallions, and leeks. These plants work well to deter common carrot pests such as the carrot rust fly and Japanese beetles. They also deter aphids. While willow-carrot aphids only feed on the green stems of carrots, they do spread harmful diseases, such as Motley Dwarf Virus, which stunts carrot growth considerably. Parsley – Carrots love parsley as parsley attracts beneficial insects. If you let your parsley go to flower, it will attract hoverflies which are great pollinators for carrots, while the larvae of hoverflies eat many pests, such as aphids and mealybugs. Rosemary – Rosemary deters carrot rust flies, among other pests. The smell is very overpowering to these flies. Be careful not to grow rosemary in front of the carrots’ sunlight, as bushes can grow quite large. Brown Mustard and Buckwheat – Wireworms (the larvae of click-beetles) can be a nightmare. Planting brown mustard and buckwheat before you plant carrots can help to get rid of them. Catnip, Peppermint, and Tobacco – All these plants deter flea beetles, whose larvae like to feast on carrots. Sage – Sage also deters carrot rust flies with its scent, while not needing much water, leaving the moisture for the carrots. Lettuce – Lettuce grows very well next to carrots and vice versa. You’ll find additionally, though, that by planting lettuce, the big leaves cool the soil and prevent weeds from invading. Radish – If you plant radish seeds at the same time as carrot seeds, they grow more quickly than carrots and push open the soil. By the time carrots come to really get going, your radishes will be almost ready to harvest. This not only gives you a staggered crop, but helps you to prepare the soil for the carrots. Carrots have companions but they also have enemies. Knowing what to avoid can prevent you from stunting the growth of your carrots or your other vegetables. Potatoes – Planting carrots with potatoes not only forces them to compete for space, but also for nutrients. Both carrots and potatoes need a lot of phosphorus and planting these together means neither crop gets the amount it requires. Parsnips – Parsnips also compete for phosphorus as well. Equally, parsnips and carrots can fall foul to the same diseases so planting them together makes them a hotbed for disease and pest explosion. Umbellifarae – This family includes coriander, dill, and cumin. It’s the family that carrots belong to. Planting many of these plants will cross pollinate with carrots, especially dill, coriander, and fennel. Parsley is the only exception as it works well with carrots, however if you are seed-saving, you need to be careful. Growing carrots it relatively simple. They like a lot of sun and loamy soil, and tend not to interrupt much around them. That said, you shouldn’t be growing carrots with other rhizomes as you’ll end up with root competition, phosphorus competition, and an increased risk of disease. Equally, don’t grow them with other family members or you’ll get cross-pollination. In terms of the beneficial partners, look for plants that get rid of beetle larvae, deter carrot rust flies, and eat up aphids. Strong smelling Mediterranean herbs are great deterrents for bugs, whereas plants that attract predatory wasps and hoverflies will increase pollination as well as working to munch up all those nasty pests. Remember that while growing plants like tomatoes and rosemary can improve the flavor of carrots, they’re in danger of blocking the sun. Make sure you plant wisely when considering space and time, to ensure that each plant has the sunlight it needs without affecting your carrot’s daily dose.